Explore simple and complex data, and explore data relationships that were previously hidden. Qlik Sense: a new era has dawned for the world of information. This new software takes the process of data sieving and analysis from IT and puts it back in the hands of the one who uses the data: you. Qlik Sense provides a secure environment that is IT-driven – ensuring secured content and resource management and, subsequently, security and quality. 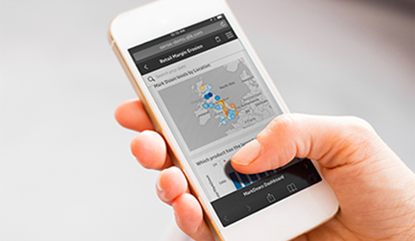 Qlik is not confined to or limited by borders, and can be also used on a number of hand-held devices. One of the best features of Qlik is that it condenses vast amounts of data into an easily comprehensible and manageable tool to help you attain an understanding of the data. How is this possible? An amalgamation of graphs, tables and even maps allows you, with the help of Qlik Sense, to explore and interpret the data findings. Instant updating of the data allows you to make in-time decisions. Complex data can easily be integrated by way of direct integration. Another feature is the Smart Search function that searches through all your data and enables you to understand the relationship between the data and as a result make informed, holistically-based decisions. With the help of Qlik Sense, you can share your findings and/or insights easily through a securely-organised and central hub. Any hand-held device (from smartphone to iPad and Tablet) can be used to access the data.